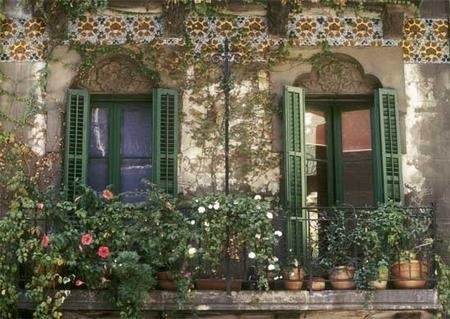 Barcelona is a city containing some of the most splendid architecture anywhere on this globe. Like an onion, it has integuments of different eras growing out from its classical and splendid Gothic Quarter which itself is built over its Roman antecedents. The serpentine narrow streets are filled with beautiful old balconied buildings like this one. Here the tilework has come to life or, perhaps the vines have become frozen in the tiles.